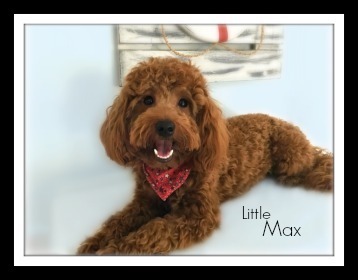 Little Max was born here at Lakeview Doodles in 2016 from Amber & Milo. He is the sweetest, most happy go lucky, well behaved little guy (just like his siblings)! He lives with his guardian mom & dad, along with his four legged sister Katie (not biological sister), pictured towards the bottom of this page. We're looking forward to his future pups! 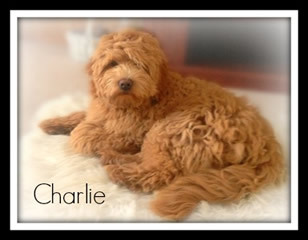 Charlie was born at Lakeview Doodles in 2013 from Brooklyn (Sophie's line) and Milo. Charlie has the most calm, friendly and layed back personality, just like his 4 legged parents. At home he enjoys snuggling with his human family, and his four legged brother Teddy Francis. 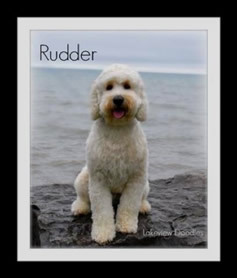 Rudder is the new guy in town! He came to us as a 8 weeks old, and has grown up into a handsome fella! He lives with his guardian family, and has enjoyed camping & meeting lots of new friends this past summer. We are looking forward to his upcoming litters! 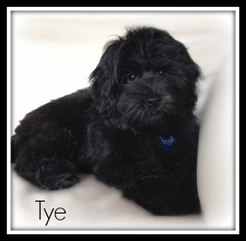 Tye is a beloved member of our family, who shares a birthday, and is best friends to our youngest son Joey. His human like personality endears him to eveyone he meets! 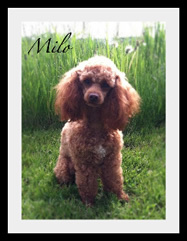 Milo joined our Lakeview family in 2013. Before then he sired several litters for us, which we were beyond happy with! Milo has a charming, calm, friendly & delighful personality. 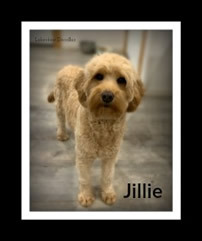 Jillie was born at Lakeview Doodles in 2017 from our retired Jazzy (Double Doodle & Goldendoodle) & Charlie (F1b Goldendoodle). Jillie Bean as we call her, has the most happy & affectionate personality. She enjoys playing with our other dogs, especially her best friend little Jackie! Her coat is a medium curl, super soft fleece, & non-shedding. We are looking forward to her first litter coming soon! 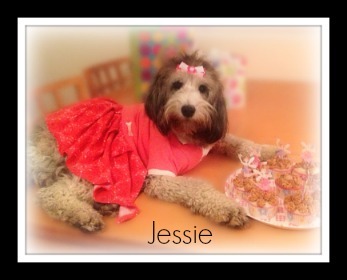 Jessie is a Double Doodle who is our daughter Julianna's constant companion! Her parents are our retired "June" an (Australian Standard Labradoodle) and "Tucker" an (F1b English Tiny Petite Goldendoodle). 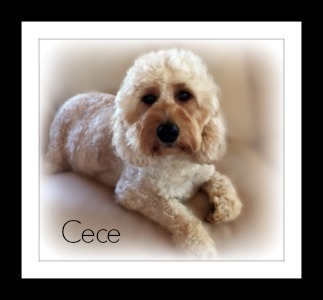 Cece is the daughter of retired Kateria F1 English Goldendoodle and our poodle Milo. Cece enjoys hanging around with anyone two or four legged, whether playing or just relaxing! 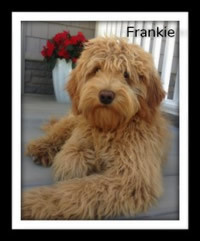 Frankie is an English F1b Goldendoodle who's the daughter of our retired Brooklyn an English F1 Goldendoodle, and Milo our Toy Poodle. Frankie is the most laid back, relaxed girl just like her brother Charlie pictures above! 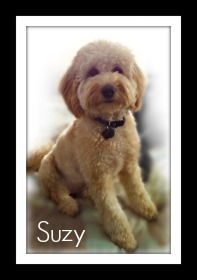 Suzy is an English F1b Goldendoodle who is also the daughter of our retired Brooklyn an English F1 Goldendoodle, and Milo our Toy Poodle. She lives with her amazing guardian family Lori, Chris & Gabe who have been a huge part of Lakeview Doodles from the time they brought Goliath home in 2005. Since then they've added Dolly almost 7 years old, and little Suzy now almost 3 years old. Gabe asked me to write that Suzy is very cuddly, sweet, loves everyone she meets & loves to give him kisses, even when he doesn't want them!!! 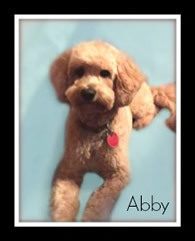 Abby is an English F1b Goldendoodle who is the daughter of now retired Penny, an English F1 Goldendoodle, and Milo our Toy Poodle. Abby is a very affectionate, sweet & happy little girl! She lives with her guardian family, which includes her 4 legged mom Penny! She spends most of her days as a comfort pup to her human sister who has recently undergone several medical procedures. Ginger was born at Lakeview Doodles in 2014 from Milo & now retired Dolly. 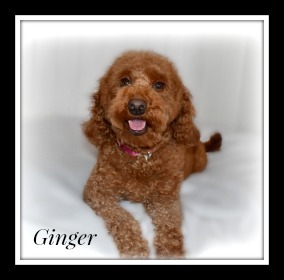 Ginger is a very sweet girl, who makes friends easily, and has such a go with the flow personality! Bailey is from Milo & our now retired Emma. She is the sweetest, most affectionate girl, who lives with our Aunt Sandy. 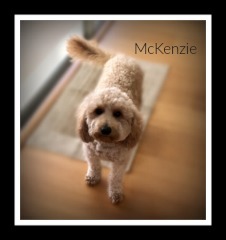 She spends her days playing with her four legged siblings Buddy & Zoie, also Lakeview Doodles! Gemma is from Milo & retired Kateri. She lives with her guardian family and enjoys other doogie friends, playing fetch & she is even getting swimming lessons from her dad! In her down time she loves just being with her two little human siblings & family! McKenzie was born in 2016 to Milo & Penny, who is now retired. 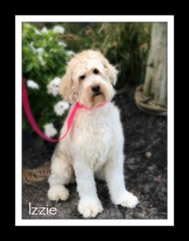 Kenzie lives with her guardian family, and likes to spend her days playing & romping with her older Lakeview Doodle sisters Becca & Brie. In her down time she enjoys hanging out with her human brother Brayden & loves to watch over her human baby sister Emerson! Nisa is from Milo & retired Kateri. 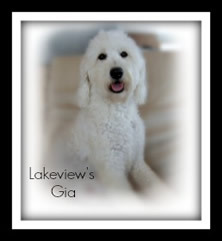 She lives with her guardian family, which includes Nala her 11 year old Labradoodle sister from Lakeview Doodles! 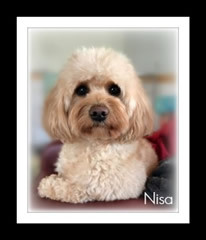 Since Nisa is the baby of the family, she loves to be held, coddled & spoiled!!! Macie is from Milo & our retired Frosty. 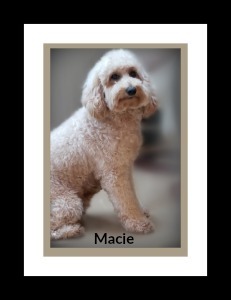 She lives with her guardian family, which also includes her sister Jaina, who is retired Double Doodle from Lakeview Doodles! She enjoys playing soccer with her human siblings, and snuggling up with them in her down time! 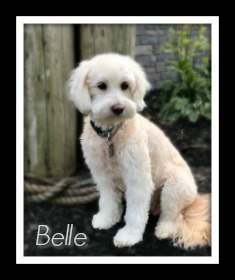 Belle is a daughter from Mazie & Charlie's first litter in 2015. She is very much like her 4 legged parents, very loving and affectionate, and people oriented! Belle lives with her guardian family, and enjoys the friends she gets to see quite often, from the sewing classes which are held at her house! 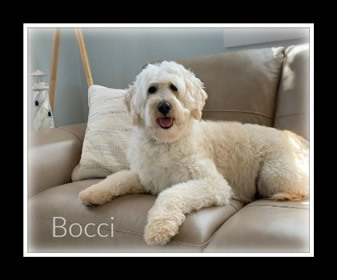 Bocci was born at Lakeview Doodles, and is full sisters to Izzie (below)! She lives with our family, and is a very calm, sweet & affectionate girl! She enjoys playing with her four legged friends, or just relaxing with her two legged friends! Izzie is the daughter of retired Bella Rina & Teddy Francis! She lives with her three human sisters & parents, where she get their undivided attention! We just love her, and it's always so nice having her come to visit with us! 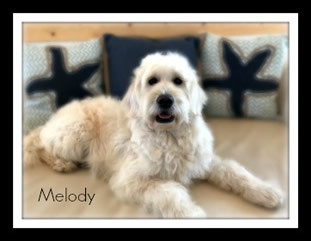 Melody is an English Multigen Goldendoodle, who's parents are a F1 English Goldendoodle, and an English Multigen Goldendoodle. 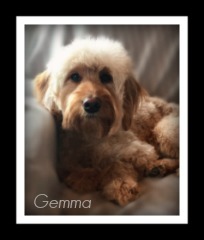 She lives in a guardian home with her three other doodle friends, and is just the sweetest, gentle, well behaved girl! 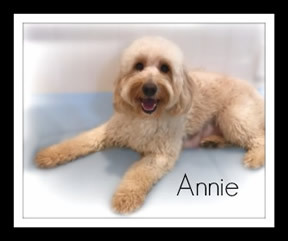 Annie was born at Lakeview Doodles and is the daughter of Mazie & Teddy Francis. If she's not romping around, having fun with her doodle friends, you'll find her right next to your feet! She's just a great girl! 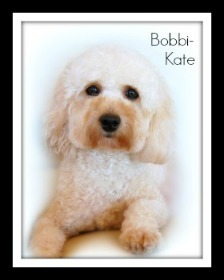 Bobbi-Kate was born at Lakeview Doodles in 2014 from Amber & Milo! Bobbi-Kate or Chula (her nick name),is the sweetest girl and happens to be best friends with our little grandson Gianni. From the day Gianni was born, (when Chula was 6 months old), she has watched over him and follows him everywhere! 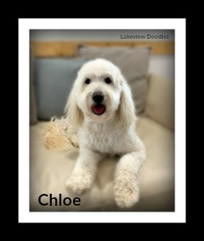 Chloe joined our Lakeview Doodle family in 2016! 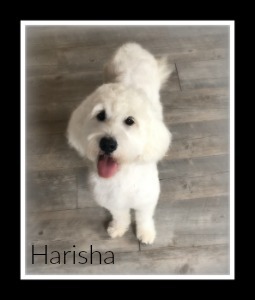 She is full sisters to Harisha (below), with her mom being a small English Cream Golden Retriever & her dad an English Multigen Goldendoodle. She lives with her guardian family, who smother her with lots of love and affection! Harisha joined Lakeview Doodles in 2016! 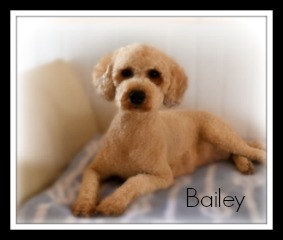 Her mom is a small English Cream Golden Retriever & her dad is an English Multigen Goldendoodle. She lives with her amazing human mom Judy, who also has three other Lakeview Doodles Chewbacca 12, Princess Leah 10, Kateri 6 & then Harisha 2 years old! 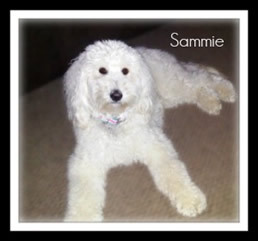 Sammie was born here at Lakeview Doodles in November of 2014 from our now retired Zoey & Marlo. She lives near by with her guardian family. She enjoys "hanging out" with their teenage kids & fun mom & dad! The girls below are full siblings, but from different litters. Thier parents are our retired Princess Piper a Medium Poodle & Yukon an English Cream Golden Retriever. 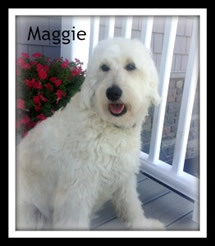 Maggie is a fun loving girl, who enjoys everyone she meets! She currently lives with our family, and in the future we'll be looking for the perfect guardian home for her. Gia was born in here in 2014 & is our daughter Julianna's constant companion. Gia enjoys doing, well anything Julianna does, and is a very gentle, calm, sweet girl! Please read before contacting us about stud service, no exceptions will be made.